The school holidays have ended but we certainly had a great time. Lots of art and craft, picnics every day, friends over for play dates, and some adventuring in the undergrowth of the garden borders. 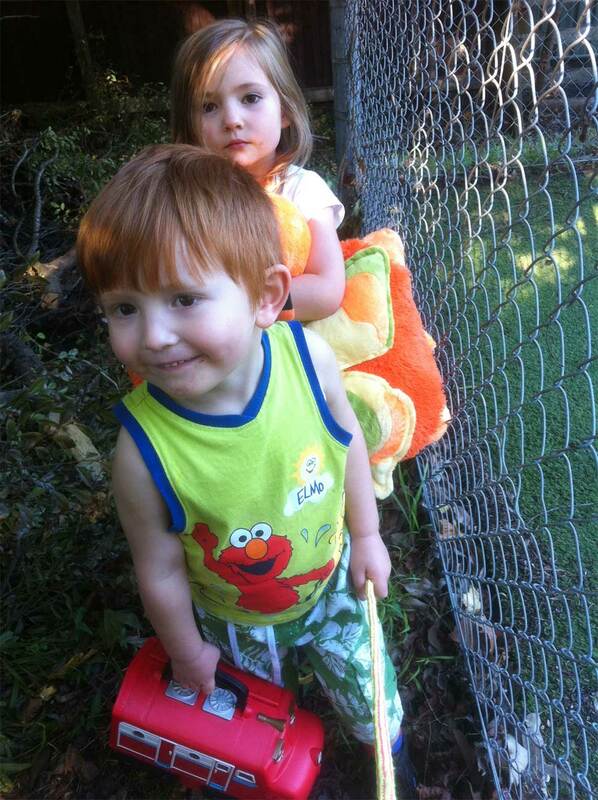 Cilla and Eddie clinging to the rope which led them through the wilderness that borders the tennis court. 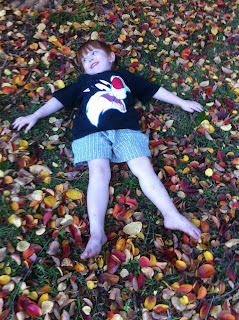 Eddie making an autumn leaf angel in the Crepe Myrtle leaves. This is the only tree in our big garden that changes colour well, in spite of the many Liquidambers, which are consistently disappointing year after year. Admittedly, we are on the coast and the climate isn't all that cold so I'm not really complaining. 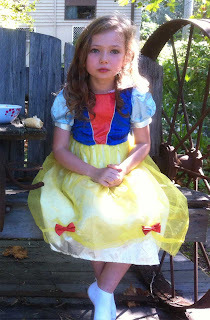 Fancy dress time for Sophia. [I found this photo on the internet and haven't been able to find any attribution for it. If the photographer asks me to remove it from here I will, of course. ] For ages I've had a plan for a garden house/studio in my Secret Garden though I only envisaged a timber structure. When I found this photo I sent it to Andy, just commenting that it was lovely. Andy has now collected a motley pile of windows and doors and is prepared to work his magic on them. I'm thrilled to bits - it won't be a copy of the house pictured but it will be interesting, and knowing Andy, it will be beautiful. 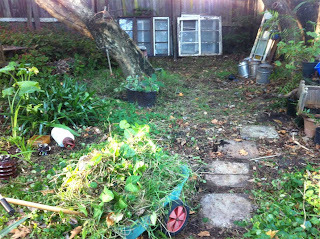 I've decided where it will go and have started clearing the space, which entails moving lots of bulbs, which will be no problem at all. I garden on the principle that most things will thrive but if anything dies then that's just too bad. Messy but things are happening. The house will go from the pathway up across to the left and the doorway will look up the garden to the crab apples, frangipanis, hydrangeas and azaleas. And the natives of course including an enormous eucalypt. Windows and doors with coloured glass are stacked against the fence. The rather strange looking tree at a slant in front of the windows is a magnificent old jacaranda which slopes halfway across the side of the garden. This is William, one of the Macleay Museum's rare papier-mache anatomical models. William was made in France in 1861 by Auzoux (1797-1880). 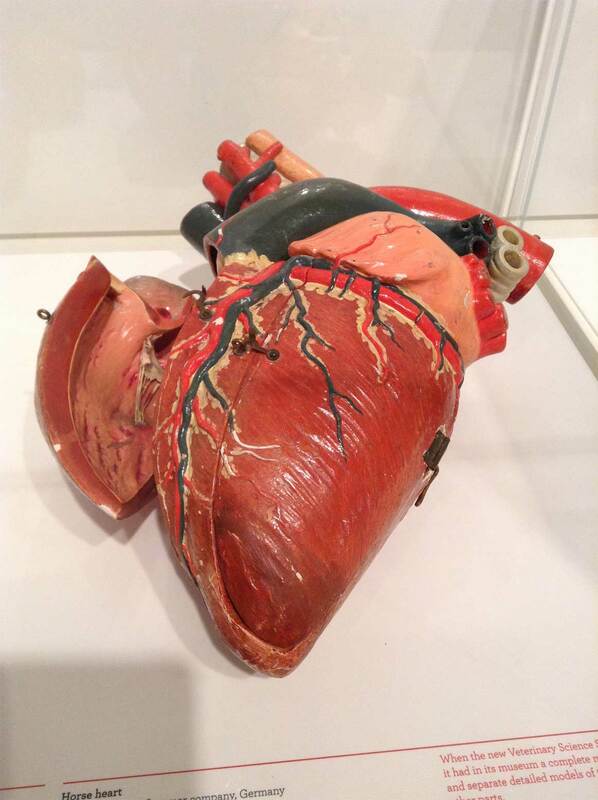 The Museum, in the University of Sydney, has the most wonderful collection of scientific models made for teaching purposes. This next photo is a model of a horse's heart, I think my favourite piece in the exhibition. The exhibition goes until 9 August and while the Museum is quite small it has a wealth of treasures worth checking out. I had been spending a couple of days in Sydney, went to lunch with Australian Museum friends and then we went on to the exhibition. One of the best things (apart from catching up with friends) about going to Sydney is the train trip, one and a half hours of great scenery and time to read on my iPad Mini. Taken from the train window, just before the train pulled into Gosford Railway Station. Views like this feature much of the way. 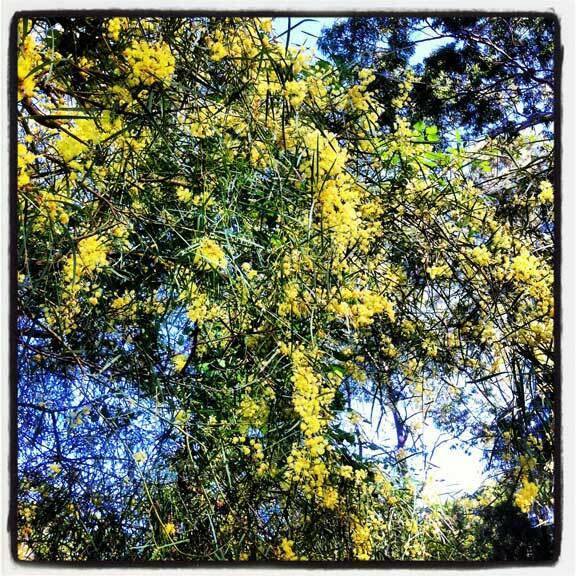 One of my favourite Australian trees - this Wattle is in the grounds of Wamberal Public School and I walk by it daily as I take the girls to school. Speaks of pure sunshine to me. Does anyone remember the wattle song that I learned in Infant's School? With blossoms for the wattle. Different Wattle trees flower from about now in autumn right through summer, so there is generally a wattle tree flowering somewhere in Australia. Always a little piece of sunshine somewhere. What a lovely post: chock full of eye candy! 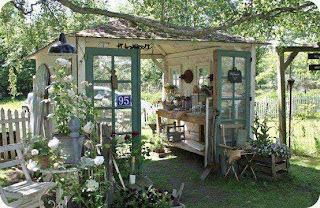 I cannot wait to see the lovely garden house that Andy builds for you! 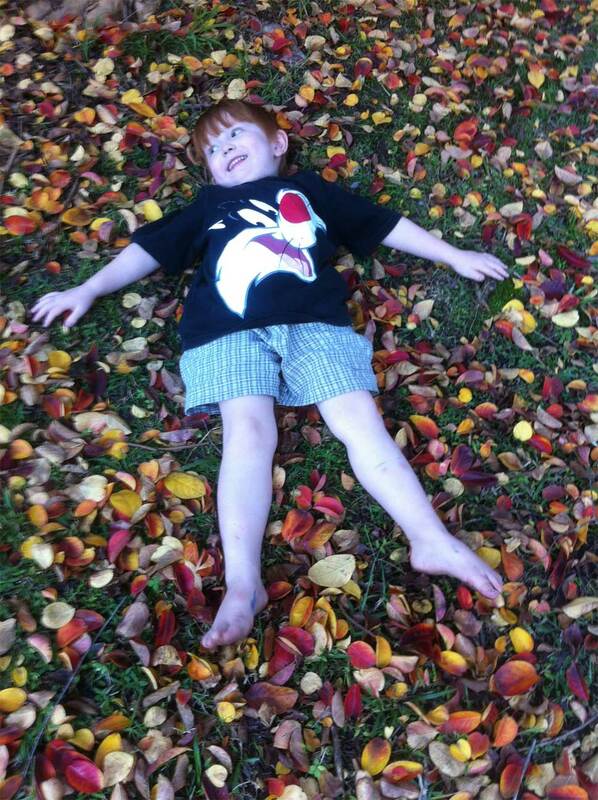 I hope you sing the Wattle song with your Grand Cherubs as you walk them to school. Some of my fondest memories of my Grandmothers come from songs and poems that they recited or sang to me when I was a little girl! I don't know the Wattle Tree (don't think we have it here), so will look it up. Warm Hugs to you Dearest Carol! Judy, I'm excited at the prospect of a little garden house - I will be able to spread myself and my collections into a whole new space! 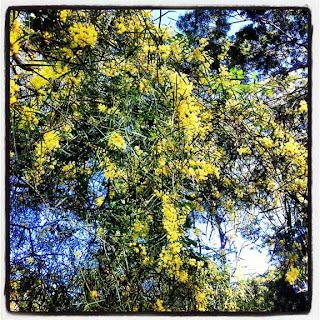 The wattle is an Acacia, (or Mimosa) and there are some native to the Americas. Yours may have thorns. I still sing (in my now very cracked voice) songs I sang with my father, including the Wattle song. The children are patient with my dreadful singing. B, yes, I love the idea too. It will probably a while before work starts, I am on a "list", but once Andy gets going it will be pretty quick. Fingers crossed! A friend built a similar one and had wonderful, filmy drapes. Beautiful until the plants grew, then the drapes had to go! Drapes would be gorgeous but I suspect there will be too many spiders taking up residence to have anything curtainy. The G&T will certainly feature and so, I hope, will sitting in the sun dreaming. 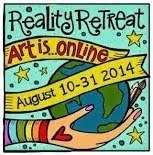 I'm collecting ideas on my Pinterest page. The garden room sounds fabulous. 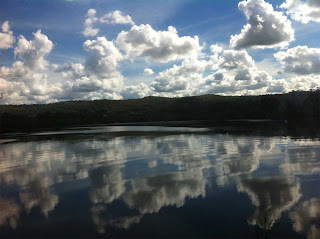 I love the photo of the cloud reflections. Mig, I spend ages just standing in the garden planning it all. And yes, the reflections from the train are wonderful. Certainly makes the train trip worthwhile. Love that garden room, it's totally beautiful!